We’d love your help. Let us know what’s wrong with this preview of Greta the Great Horned Owl by Christie Gove-Berg. Greta the Great Horned Owl is out hunting mice. She has no idea that her life is about to change forever. A train strikes her, severely injuring her wing and leg. A rescue team brings her to a wildlife rehabilitation center--and this is just the beginning of her story. Will surgery save her wing? Can Greta learn to fly again? Her only hope of returning to the wild is to prove that she can hunt. 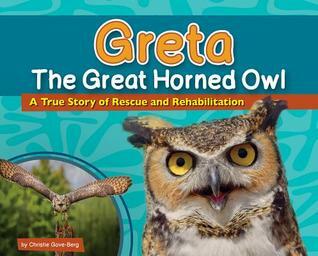 To ask other readers questions about Greta the Great Horned Owl, please sign up.